SAO PAULO: Brazil kicks off the World Cup Thursday hoping to unite the football-mad country after a chaotic seven-year build-up plagued by violent protests. The 32-team extravaganza gets under way in the teeming mega-city of Sao Paulo, where the host nation's beloved 'Selecao' faces Croatia at 5:00 pm (1500 GMT) before 61,600 supporters and a worldwide television audience of several hundred million. Thursday's Group A match signals the start of a month-long football fiesta taking place against backdrops which showcase Brazil's breathtaking diversity, from the picture postcard beauty of Rio de Janeiro to fading colonial grandeur of Manaus, deep in the Amazon. 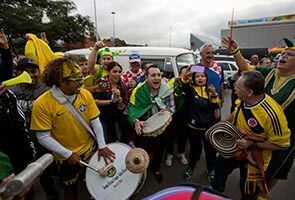 After years of apathy and simmering resentment at the tournament's record $11-billion price tag, Brazilians were grudgingly embracing World Cup fever in the final hours before the big kick-off. Brazil coach Luiz Felipe Scolari urged compatriots to unite behind his players as they launched their bid for glory. "To all Brazilians I want to tell you the time has arrived. This is our World Cup," Scolari said in an eve-of-tournament rallying cry. The popular Scolari, who masterminded Brazil's last World Cup win in 2002, said his team were seven matches from immortality. "The first step is Croatia," he said. "After that we have six steps that we want to go up if we want to win the World Cup." As the last of the 32 teams who will contest the greatest prize in football arrived in Brazil, mounting evidence of World Cup fever was visible. Rio's iconic Christ the Redeemer statue has been illuminated in the colors of all nations taking part while Brazilian flags fluttered from cars, bars and apartments as excitement built. In Rio de Janeiro, some of the 600,000 foreign fans travelling to Brazil thronged the famous Copacabana beach, staging impromptu football matches. Hollywood star Leonardo DiCaprio was among the overseas multitude jetting into the country, taking in the tournament from the luxury of a mega-yacht offshore. Twelve government leaders or heads of state will be among the VIPS at Thursday's opening ceremony. But even though more Brazilians are sporting the yellow jersey of star forward Neymar, discontent continues to bubble. Scattered protests are planned in several host cities during the tournament. And as Sao Paulo subway workers late Wednesday voted against a repeat of the strike which plunged the city into gridlocked paralysis last week, airport workers in Rio announced a partial 24-hour walkout. The multi-billion-dollar cost of the World Cup has angered many in a country which has chronically under-funded health and public services and rampant violent crime. Brazil's President Dilma Rousseff warned that her government will not tolerate a repeat of last year's protests. FIFA President Sepp Blatter has responded to the scandals by shoring up his power base. On Wednesday he signalled his intention to seek a fifth four-year term next year, despite calls for him to step down. "My mandate will finish next year... but my mission is not finished," he said to boos from sections of the FIFA Congress. Japanese former FIFA executive committee member Junji Ogura however said many senior officials wanted to see the Qatar allegations examined. "There are a lot of people in the executive committee who feel that way, and it's why things are being investigated," Ogura, the Japan Football Association's honorary president, told Kyodo News. For all the off-field problems, the tournament itself has the makings of a classic. Reigning champions Spain are bidding to make history by becoming the first side from Europe to win a World Cup in South America, which last hosted the tournament in 1978. Vicente del Bosque's side have dominated international football for the past six years, winning two consecutive European championships either side of their 2010 World Cup triumph.